WHY HAVE A SMARTPAGE SITE ? A SmartPage site is a blend of the simple focus of a landing page and the blocks of information found in a full-fledged website, designed to display on a single, mobile-responsive page. Your content is displayed in a vertical format, perfect for scrolling on all devices, with the content and imagery strategically placed to encourage perusal and lead to your call to action. Because of the mobile revolution, people love to scroll and we take advantage of it. From a design standpoint, scrolling allows you to decide the order in which your content is presented to your audience, creating a "guided tour" of your message. Each SmartPage site is customized to match your individual brand colors and content, all for a price that fits your needs. It's everything you need to showcase your business for a great price. Every SmartPage site is built on a responsive framework. They are optimized to look beautiful and function smoothly on desktops, tablets and smart phones. Your online audience will also appreciate the lightweight and faster loading time on their hand held devices, making for a much more pleasant and memorable user experience. Your SmartPage Design is customized with your own brand colors, imagery and text content to provide a site that carries the essence of your brand. 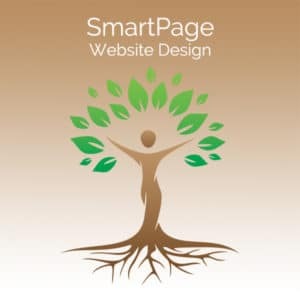 As a single page website, our SmartPage site will save you hundreds of dollars. The time needed to create your custom design and go "live" is much faster than creating a multi-page site. With a smaller footprint, a SmartPage site is easier for you to create content for, just be concise and clear in your writing to enhance your site visitor's experience. The cost of a SmartPage site is far less than a traditional multi-page website and, because of it's simplicity, it is much easier for you to maintain and update. SmartPage sites are optimized to deliver your message quickly and look professional, whether your customers are on a desktop, smart phone or tablet. Each SmartPage site is customized to match the look and feel of your branding colors and images. We will sketch out a rough draft of the site before coding begins, to make sure that our vision imparts your style. We offer 2 affordable packages to choose from. The Simple SmartPage package includes a single page, responsive website customized to match your branding and message. It also includes a contact form or opt-in box for your email system and social media links. The Enhanced Smartpage Package includes everything found in the Simple plan, plus basic set up of new Mailchimp email system and import of delimited list of contacts from one pre-existing list. Not quite ready to begin, but need some help? Quite often I find that newer business people know their craft from start to finish, but have no idea what to put onto a website, how to choose the feel for how they want to communicate, where their business intentions meet their personal expression, what their ideal clients need to see in order to feel convinced they THEY are who they must work with. Rather than waiting for you to gather ideas from a variety of sources and spend weeks or months working through on your own, I offer one-on-one coaching to clients who need help knowing what to place on a new site. We create a clear list of what you need prior to beginning site design and then break this down into manageable steps. You'll have a short list of assignments to complete each week, chosen based on the what you already have and where you need to be. While there is structure in this process and my purpose is to keep guiding you in forward movement, there will be exercises that help you break through writing blocks, regain energy and excitement for your project and help you see more clearly how to present yourself to all those ideal clients waiting to find you! All accomplished in weekly scheduled video chats (with the option of recording both audio and video for later review). Reach out to me if coaching is calling to you. I also offer a care plan which includes updates to your site theme and plugins, backup and security monitoring, all for a monthly fee of $47+. Ask about this plan when you schedule a FREE consultation. Care plans are primarily only available for Web Medicine Woman-created sites. Some exceptions are made depending on theme/plugins in use. If you think one of my customized SmartPage sites is a "smart" and affordable choice for your business, please contact me to schedule your FREE consultation via phone, Zoom or Skype. For clients who need something more extensive than a SmartPage site, full-scale site design and development is available, starting at $3500+. Thank you so much for taking the time to find out about our SmartPage sites. I look forward to hearing from you.